My volunteering organization's manager asked me if I could print organizational charts to display who is in which position in a hierarchical way (150+ positions). That way, it would help him to see which positions are vacants, to understand who has been there for a long time, and so on. It took me 2h30 to find how to scrap the data, and 3h to write a converter using Editor. a new tool I developed at the University of Chicago with an awesome team to dynamically create data-based documents in a very flexible way. Editor enables both the edition of the code as well as the edition of the final document using advanced bidirectional evaluation techniques, and runs as an http server. In this article, I will report on my experience using Editor (as of today, January 16th, 2019), to solve the problem above. The example is available for download there and the final solution is in a separate branch. To run and tweak the example, after installing Editor, run editor --openbrowser inside the folder. where the Position, Name and StartDate are all aliases of strings. My manager already had made organizational charts last year using PowerPoint, but they were quickly outdated since many people moved in and out. He was tired of updating them by hand. He handed me those charts. I looked at them. They also contained Position, Name, the picture, and the starting date, but in a hierarchical way, some positions appearing multiple times. Well, something is wrong, obviously. 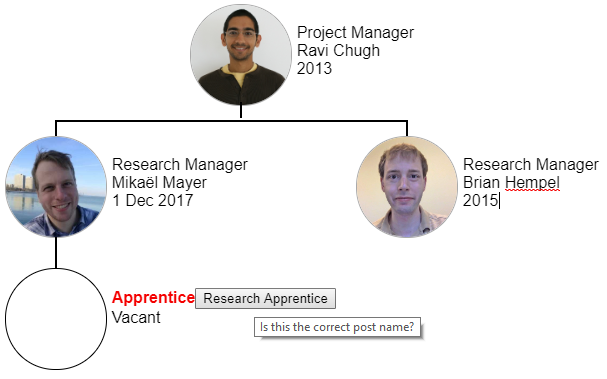 The usual way to fix this problem is to fix the tree in the code so that the positions match the inputs (Research Apprentice instead of Apprentice, or Research Manager2 instead of Research Manager for the second time). But at the same time, we still want to keep these shorter names in the organization chart. Editor made the tweaking process much easier. This solves the problem above. Even better, if I now visually rename my position to "Researcher", it automatically adds the line ("Research Manager", "Researcher") to the list renamings! Let me explain this step by step. When displaying my position, position equals "Research Manager". the first line thus returns Nothing since there is initially no renaming, and the second line returns "Research Manager" which is assigned to posDisplayName that is used to display the name in the viewport. 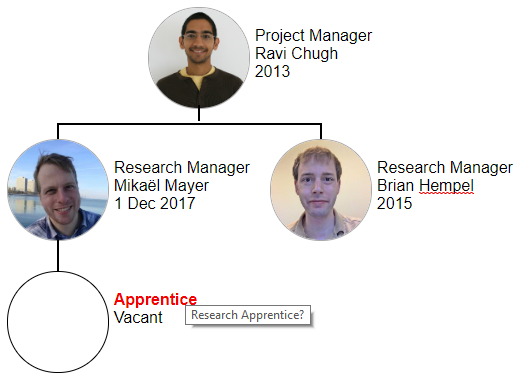 If I now visually rename my position, let's say to "Researcher", the second line back-propagates Just "Researcher" back to the first line, which in turn -- since it returned Nothing previously -- adds the line ("Research Manager", "Researcher") to the renamings. The power of lenses! It was very useful to rename 150+ positions in context. 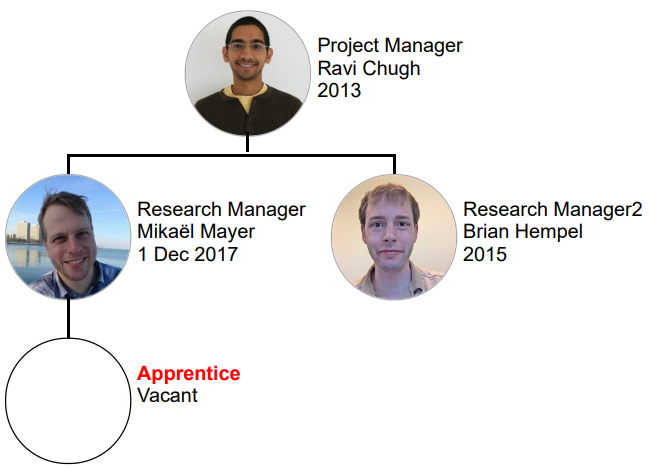 Now, if I corrected the position "Apprentice" by renaming it to "Research Apprentice", it might create such a renaming. Whatever, if the position is not found, I do not use the variable posDisplayName but the variable position so that modifications are not renamings for display but really modify the organizational chart itself, until it finds a position match. 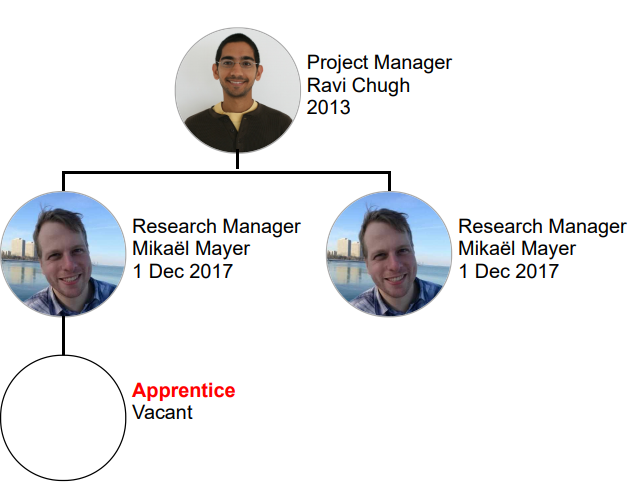 When a position in the organization chart was not found in the source data, I looked for positions in the source that could match and first displayed them when I hovered the unknown positions as suggestions on how to rename them. Html.button suggestion "Is this the correct position name?" With 1 click I can now accept a suggestion that would replace the previous value of position in the organigram tree itself. 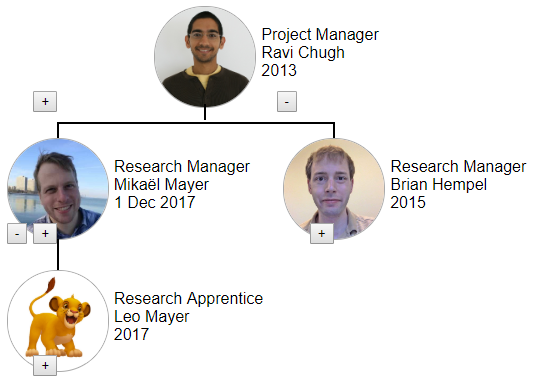 Even though this is cool, I started to get tired of first clicking on a button to accept a suggestion, and then renaming the new position to match the position nickname what was in the original paper organization chart. Oh, but this is easy, I just needed to not only modify the position name in the organization tree, but also directly add a renaming! Therefore, the previous step would have kept the display name "Apprentice". This saved me tons of time and ensured that the organization tree was consistent with the renamings. One of the interesting points found nowhere in other programming models is that I don't need to define how to walk the tree to insert the new Leader: Because the updates evaluate the program in reverse, it will insert it at the correct location in the tree. So far so good. But not everything was beautiful. Editor does not work well with huge amounts of data. If I display 20 organization charts at the same time (more than 150 people) and try to update, after 2-3 times I encounter memory exceptions. I had to develop organization charts by commenting the ones that I created before. I discovered bugs while performing multiple updates at the same time that crashed the system. Fortunately, all the files were always written on the file system so I did not experience any loss..
Editor is slow to update when the file gets larger and larger. It was not unusual for me to wait 20 seconds to delete a simple character. Furthermore, I had to wait that the previous modifications were taken into account before making new ones, which really slowed me down sometimes. I went back to code editing multiple times instead of sticking to visual edition. Many times, I want to modify attributes or styling, but I had no other way than going to devtools or edit the code itself. Having a contextual style and attribute editor would have make my life much easier. I still think Editor was the most adapted tool to develop these organization charts, and I am looking forward using and developing the new version of Editor. Oh, and by the way, Editor is open-source and welcomes contributions. Also, follow me on Twitter to know about the next releases. There is a Pull Request that highlights the interface elements that Editor made possible and that I described in this post.